If you’re a pen-and-paper kind of person, you probably have stacks of used notebooks stashed somewhere under your bed. These can take up a lot of room and become disorganized very quickly. Luckily, new smart notebooks by Rocketbook are looking to solve this problem. You might have heard of Rocketbook from Shark Tank. We stumbled across them at CES 2018 and were immediately impressed with how they work. Using their notebooks, you can easily upload your notes to the cloud, erase the notebooks, and reuse them. 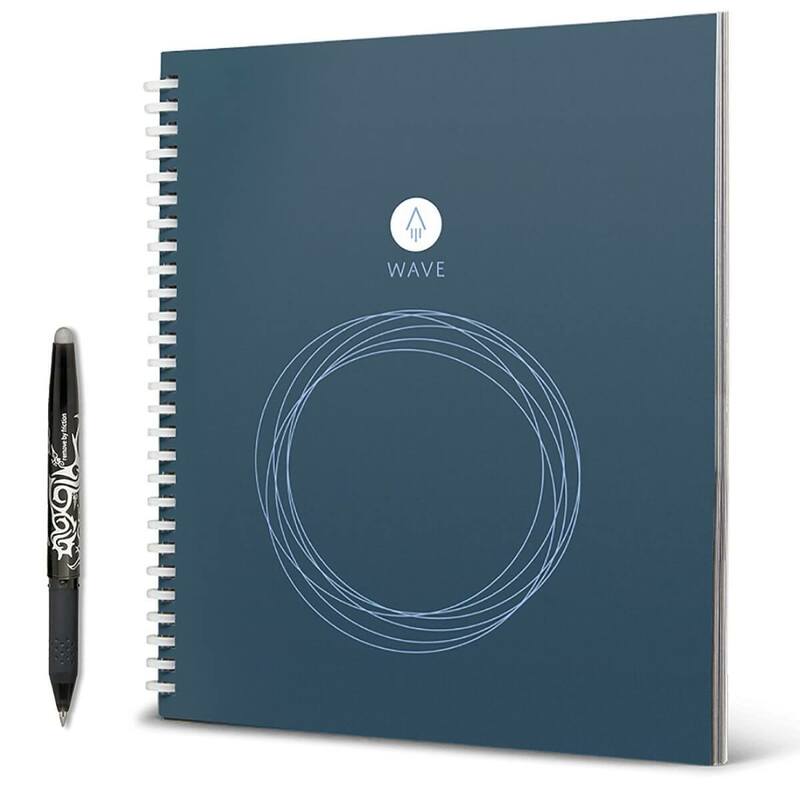 For serious notetakers, there are now two major Rocketbooks to choose from: Wave and Everlast. In this article, we will compare both notebooks in-depth since we have tried and tested each one. Our experience can help you decide which one is worth your money. 1.6 Which Rocketbook is Best? We covered the Rocketbook Everlast in this in-depth review. It’s a good introduction if you’re just figuring out how Rocketbooks work. We briefly mention the Wave at the end of the video. While both notebooks have this same functionality and other features in common, there are also some important differences to know about when shopping for a Rocketbook. Let’s start off with the differences. The biggest difference between Wave and Everlast is how you erase and reuse them. After you fill up Rocketbook Wave and are ready to erase it, place it in your microwave. According to Rocketbook’s instructions, any microwave with a rotating glass turntable will work. You will also need to put a coffee mug 3/4 full of water on the blue circle located on the cover. 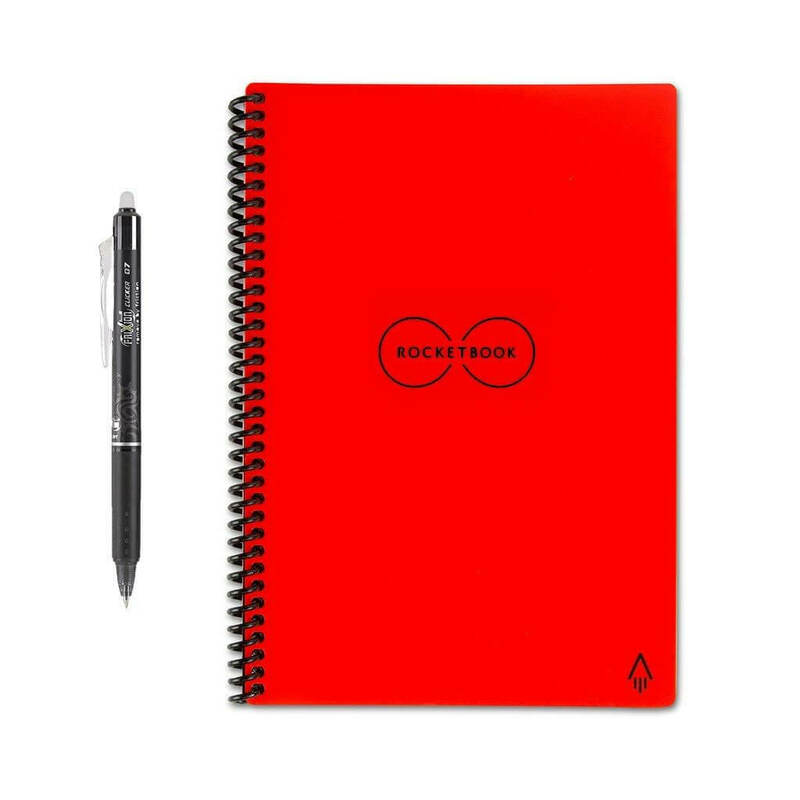 Let your notebook “cook” until the logo turns from dark to light. Watch it closely through the window or check every 30 seconds to make sure you don’t over cook your notebook. Then you flip it over and repeat until the logo on that side turns from dark to light as well. Always use the mug, as this absorbs some of the microwaves to protect your notebook. Let your Rocketbook cool in the microwave for a few minutes. It gets surprisingly hot, and the extra rest time helps it fully erase. You can reuse the Rocketbook Wave up to 5 times. Erase your Rocketbook Everlast by using a few drops of water on a small microfiber towel. Use the wet part of the towel to wipe away the writing, then use the dry part to make the notebook completely dry. You need to make sure your notebook is completely dry before writing on it to keep the pages nice. If you take good care of this notebook you can use it forever. This notebook might live longer than you. 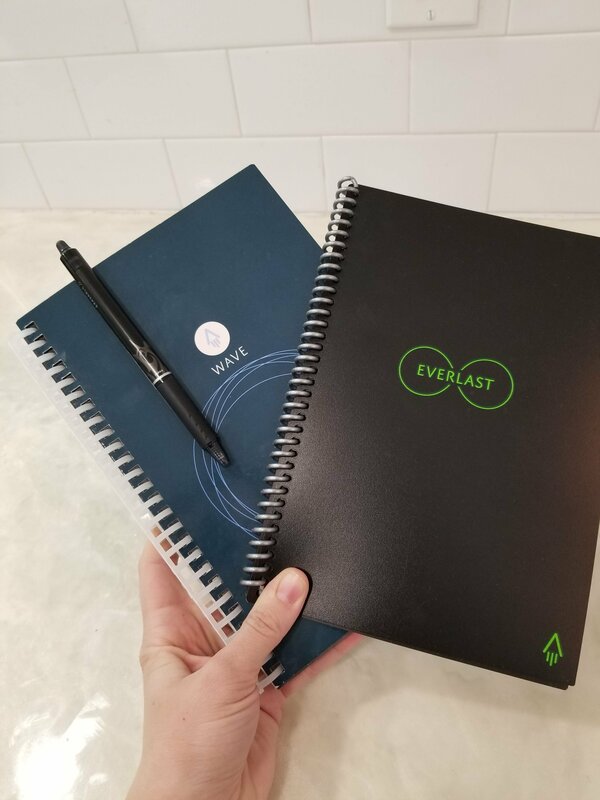 Some Everlast notebooks include the towel, but if it doesn’t come with then you can purchase one at the dollar store or even use a paper towel. Since they erase differently, you can probably guess that the notebooks have different types of paper. This can be a big factor when deciding between Rocketbook Wave or Everlast since the type of paper can affect your everyday use. In terms of leaving a shadow, we found that either notebook can leave a slight indent if you write too hard. You want to make sure that press with the pen using a light hand. That way, when you erase the notes, it doesn’t leave behind any markings at all. This notebook’s pages feel a lot like traditional paper. While there is still a little bit of slip to them, I was impressed that writing on the Wave and turning its pages felt like a typical notebook. The more realistic paper means that your Wave notebook will dry more quickly. While it didn’t dry instantly, it was similar to a normal piece of paper. After around 5 seconds, the writing was dry enough to not smudge when I rubbed the letters. While Rocketbook Everlast still feels close to a classic sheet of paper, it is a little more plastic and slippery so that water can erase it. This gives the pages a slight dry erase feel when compared to the Wave. It’s subtle, but when you are turning the pages you can feel that the notebook has a slick feeling to it. For many people, it’s not enough to be a deal breaker, but it’s a noticeable difference compared to the Wave. 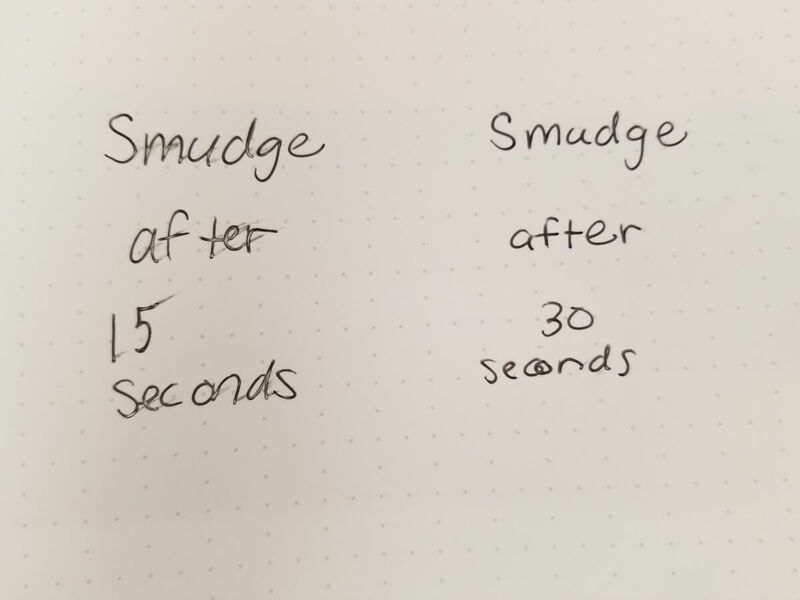 Rocketbook says the dry time is 15 seconds, but in our testing we waited closer to 30 seconds and that got our notebook completely dry so it didn’t smudge at all. For the above test, I gently rubbed my finger over the text after 15 seconds on the left, and then after 30 seconds on the right. You can see that there was slight smudging after 15 seconds, but none after waiting 30 seconds for the page to dry. When you hold both in your hands to compare Rocketbook Wave vs Everlast, you might not immediately see the differences. 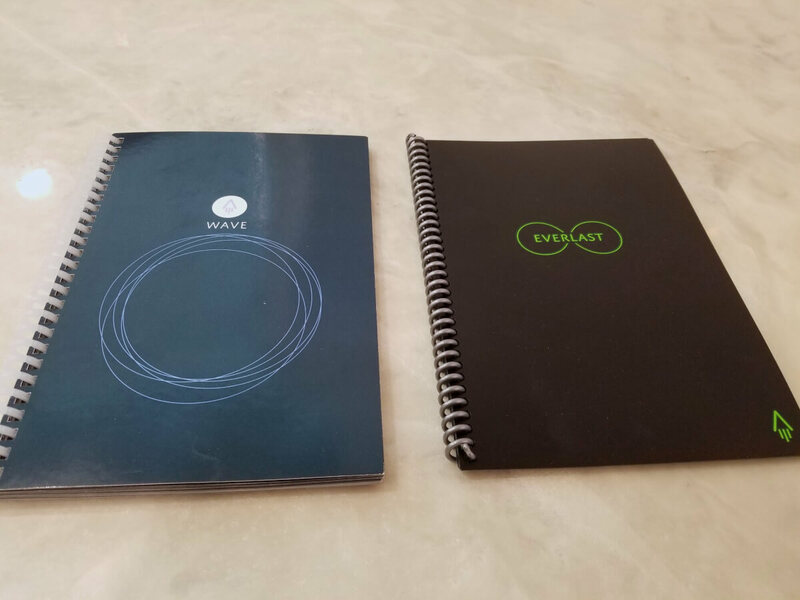 Both notebooks have similar design, and their executive size is the exact same. But there are a few other differences worth noting here. Comes in standard size: 8.5″ x 9.5.” This is more square-like than the Everlast’s letter size. One color available: The Rocketbook Wave only comes in one color: blue. Thicker plastic binding: The spiral binding on Rocketbook Wave is a thicker, white plastic. That’s probably so the notebook can withstand the heat of the microwave. Circles on the covers. Both the front and back covers have circles on them so you know where to place the mug when microwaving. These are subtle and the design doesn’t take over, but if you want a more minimalist look then this might feel busier than you prefer. Comes in letter size: 8.5″ x 11,” which is the size of a typical piece of paper. If you are set on having a notebook this size, then Everlast is the way to go. 4 colors available: red, black, light blue, and midnight blue. Thinner binding: The binding on Everlast is what you would see on a typical notebook. It’s not too thick, and much more subtle than the Wave’s binding. Plain cover. Besides the Rocketbook lettering and small logo in the corner, Rocketbook Everlast has a very plain cover without any designs on it. Here are the features that both notebooks have when you compare Wave and Everlast. Pilot Frixion pens required for either notebook. If you write with regular pens, you can expect them to possibly ruin the notebook since they won’t erase. Frixion pens erase easily if you follow the steps provided by Rocketbook. Some notebooks include one Frixion pen to get you started. Plastic cover. Both notebooks have essentially the same plastic cover. This can feel a little flimsy and cheap, considering that the notebook is designed for you to reuse it again and again. Same iOS and Android apps. This lets you upload your files as a .pdf or .jpg to Google Drive, Dropbox, Evernote, Slack, and more. The app is easy to set up and use for quickly scanning your pages into any destination you specify. Same uploading process. In the app, you specify destinations (i.e. Dropbox, email, etc). These correlate with the different symbols at the bottom of each page. When you’re done taking notes, just put an X on the symbol where you want to send your notes. Open the app on your phone and hold it over the page. It will upload immediately to the specified location. Erases in a hot car. Either notebook will erase if it reaches a certain temperature, but put in the freezer and your text will come back. Pretty impressive. Pen holder available. Both notebooks are compatible with the same pen station. You can stick this to the edge of the back cover in your notebook. It will stick out of the side, making it easy to carry your pen everywhere with you. Besides Rocketbook Wave and Everlast, there are a few other options for taking notes and storing them in the cloud. Traditional pen and paper. You can always just take a photo of your old fashioned notebook. This is super affordable, but the downside for this is that the notes won’t be as clear as scanning them. Check out a scanned Rocketbook page to the right. We compared the quality of the same sheet of notes by taking a photo of the paper, and scanning it using Rocketbook. See the difference in our Rocketbook Everlast review. 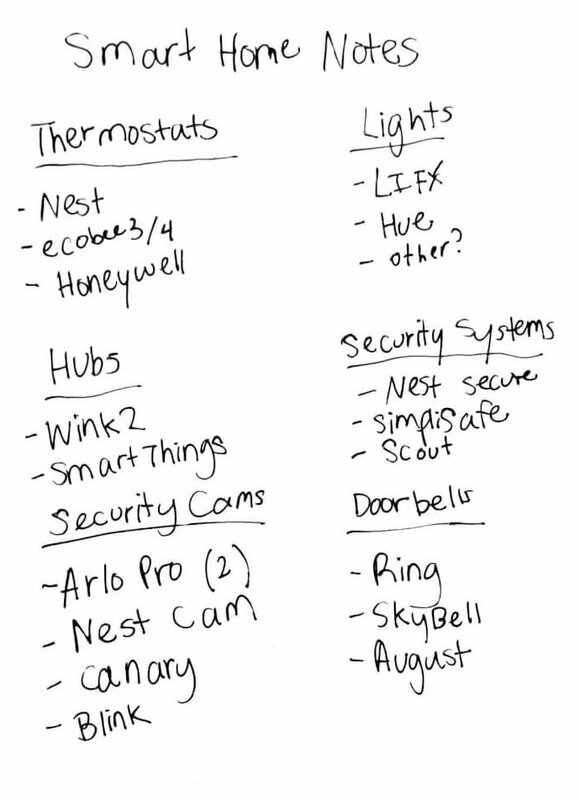 Using a scanner app can improve this quality, but it still leaves you with the problem of having to organize your notes after they are uploaded. Rocketbook sends the notes directly to whatever folder you specify, rather than just emailing them to you. It’s a dream come true for an organization freak. Boogie Board. Typically used to keep kids quiet on road trips, Boogie Boards now have a version that is compatible with an app for uploading your notes to the cloud. The Boogie Board Jot works with the Jot app so you can upload, save, and share your images. The app separates the scanned image from the background and uploads a black and white image that looks like a scan. The downside of Boogie Board is that it looks more like a toy and won’t blend in for school or meetings like the Rocketbook will. Unfortunately, we purchased the Boogie Board Jot and the app was disappointing. No wonder the app has terrible reviews. Uploads have a very high contrast and the app was glitchy. We recommend sticking with Rocketbook if getting your notes into the cloud is a top priority. When comparing both notebooks, it really depends on your personal preference. If you like the feel of real pages and think the microwavable feature is cool, go with Rocketbook Wave. If you would rather use your notebook for years instead of throwing it away after a few uses, buy the Rocketbook Everlast. Click the text links above to see current prices for either notebook. They are typically priced within a few dollars of each other. Besides Wave and Everlast, there are a few other options sold by the company that might fit your needs. One is the Rocketbook Color. This is designed for kids as a coloring book where they can draw pictures and have their parents upload them to the cloud for safe keeping. It uses the same app for uploading any art work. 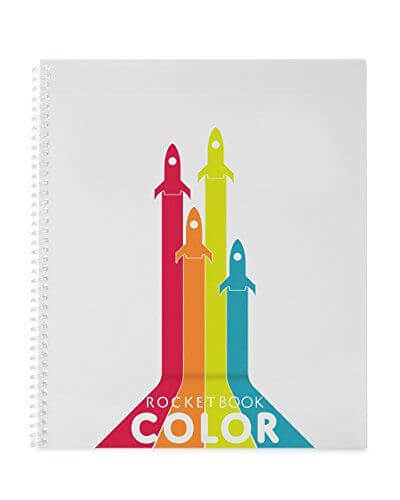 Rocketbook Color works with any dry erase products. For example, you can use Crayola’s dry erase markers or crayons. Some pages come blank, while others have dots for graphing or lines for handwriting practice. Since the notebook is waterproof, it’s more durable and a better fit for kids than traditional notebooks. Rocketbook Everlast Mini is another option. 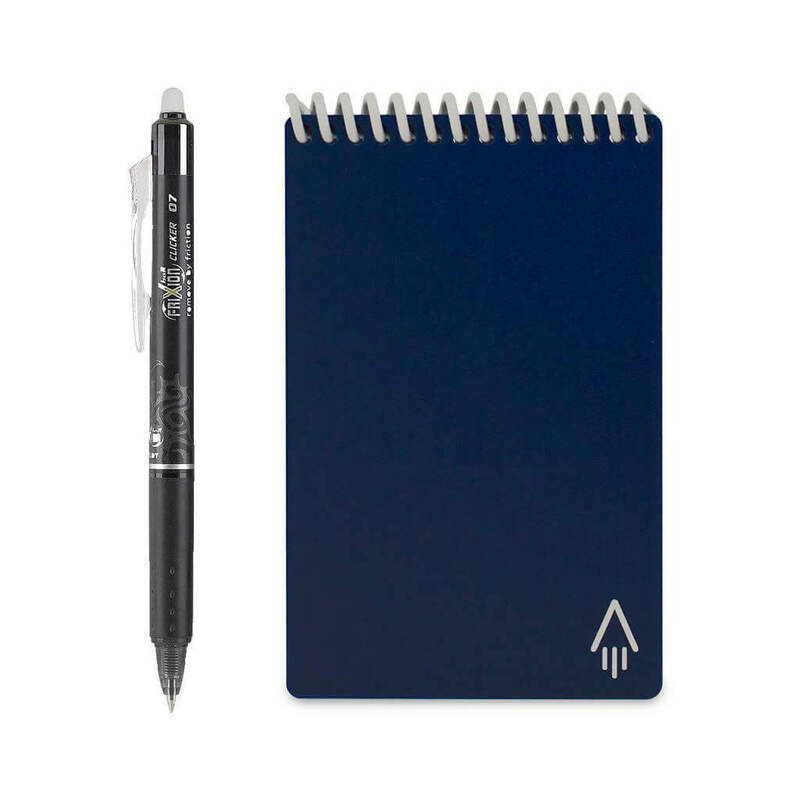 Its look, feel, and function is the same as the Everlast, but the only difference is its small size at 3.5″ x 5.5.” It makes a great miniature notebook for taking notes on the go. 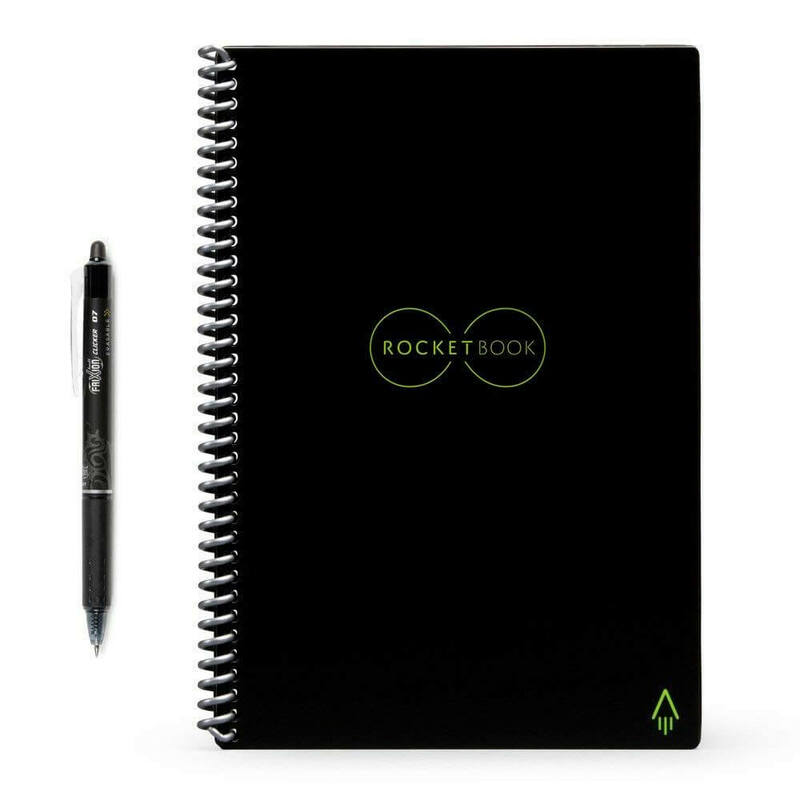 While Rocketbook is known for its reusable notebooks like Rocketbook Wave and Everlast, it also sells a few products that are for one-time use only. These may be a good buy if you need basic notebooks that still integrate with Rocketbook’s app for uploading to the cloud. Rocketbook One works like a traditional, one-time use notebook. Since it’s not for reuse, you can use any pen or marker in this notebook. It still has the QR codes and symbols at the bottom of each sheet to easily upload to the cloud. 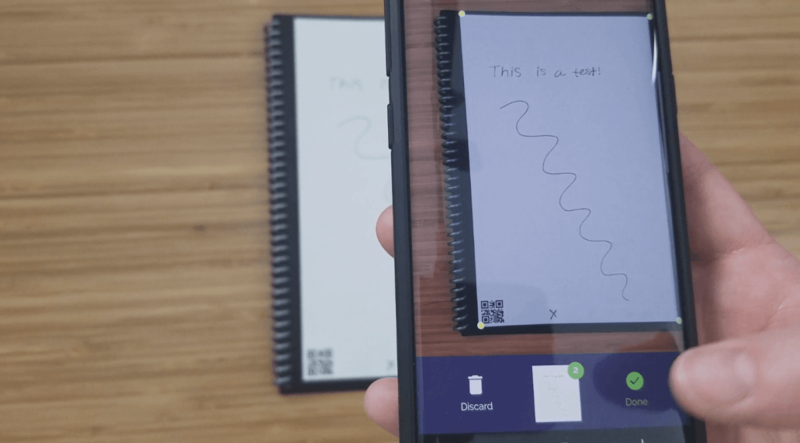 Rocketpad is a notepad with tear-away sheets. This works like a traditional notepad and is great for your desk or kitchen. Similar to the Rocketbook One, this is a single-use product that still uses the same uploading technology for getting your Rocketpad notes to the cloud. It comes in a 3-pack. These notebooks make excellent smart holiday gifts, so you may want to consider them for a loved one’s gift. In the end, you will probably be pleased no matter which Rocketbook you buy. Both Rocketbook Wave and Everlast are very high quality and have a serious “wow” factor. But they are also subtle enough to take to work or class without looking flashy. We give both Rocketbooks a thumbs up. Which Rocketbook do you prefer? Let us know your experience in the comments below!